For a while when I was a child my father worked as a drafter, but the drafting gave him some sort of hand problem, carpal tunnel perhaps, and his doctor recommended that he make bread as the kneading would be good for his hands. 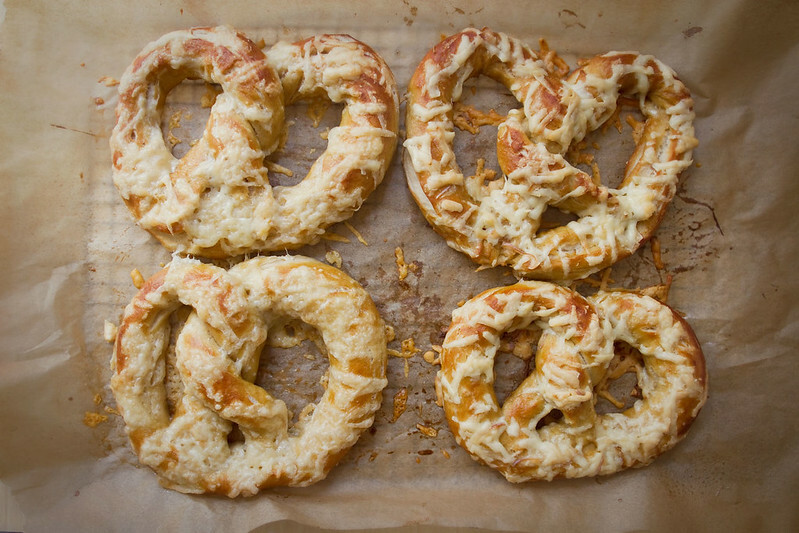 Always a big eater of those large, hard sourdough pretzels, my father began making soft pretzels instead of bread. We would knead the dough together in a large bowl, my little child hands practically useless at working the dough into a useable form. Waiting for the dough to rise was the hardest part. The kitchen would smell of flour and yeast and moist dough, one of my most favorite kitchen smells in the world, and the hour it took the dough to double in size always seemed to crawl by me at a snails pace while I tried to resist the urge to peak under the towel and see how the dough was doing. But if waiting for it to rise was the worst part then rolling the dough and forming the pretzels was my favorite part. 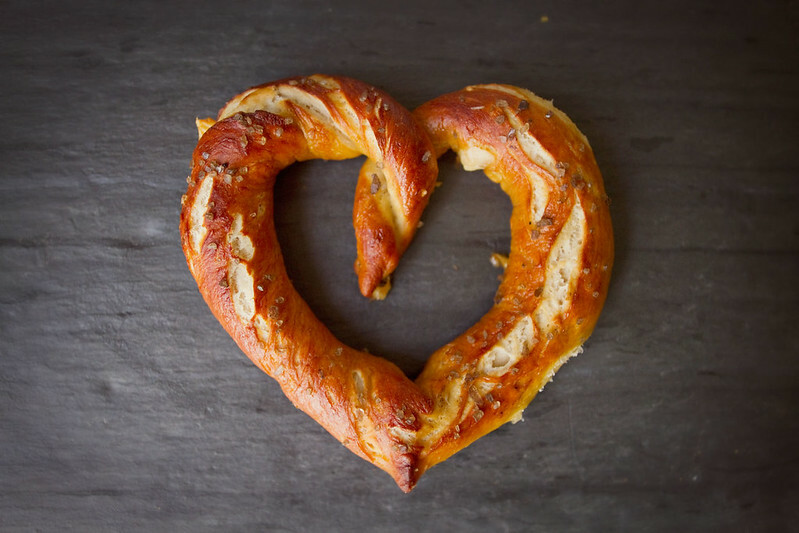 My father taught me to make the pretzel shape while telling me the legend of pretzels, that a young monk in the early days of Christianity made pretzels in the shape they are today to resemble arms crossed over ones chest in prayer. Mostly our pretzels were proper in shape, but inevitably I made some in silly shapes like twists and hearts and swirls as well. In college I started baking pretzels on my own during this big baking kick I had after a bad breakup (no, I didn't get really fat- I sent everything I baked to my ex and he got fat instead. And took me back. I highly recommend this method.) And taking inspiration from Auntie Annes I started coating my pretzels in things like cinnamon and sugar (do this after baking) and almonds (do this before baking), and cheese. Which is, of course, the best topping ever because it is cheese. I started adding beer because two preteen girls I know told me to. Seriously. We were making soft pretzels, and they said the best soft pretzels are boiled in beer so obviously I had to try that, then on the way home I was thinking of a lager laced black bread I make and I thought to myself put the beer in the pretzels. This was a fantastic decision and I will never make beer free pretzels ever again. combine flour, sugar, and salt, mix until well combined. Melt butter in small saucepan over low heat or in microwave. Measure out beer and bring to room temp- I just placed mine near my little pot of melting butter. Once yeast has foamed up like the head of a beer add the flour to the bowl followed by the melted butter and 1 Cup beer. Using stand mixer, (I worship my Kitchenaid) or wooden spoon mix until a dough forms, adding more flour if the dough is too wet, more water or beer if it is too dry. Allow to rise 1 hour, or until dough doubles in size. I like to cover my bowl with a towel and put it in a warm place like inside a slightly warmed (then turned off) oven, or on top of a running radiator. 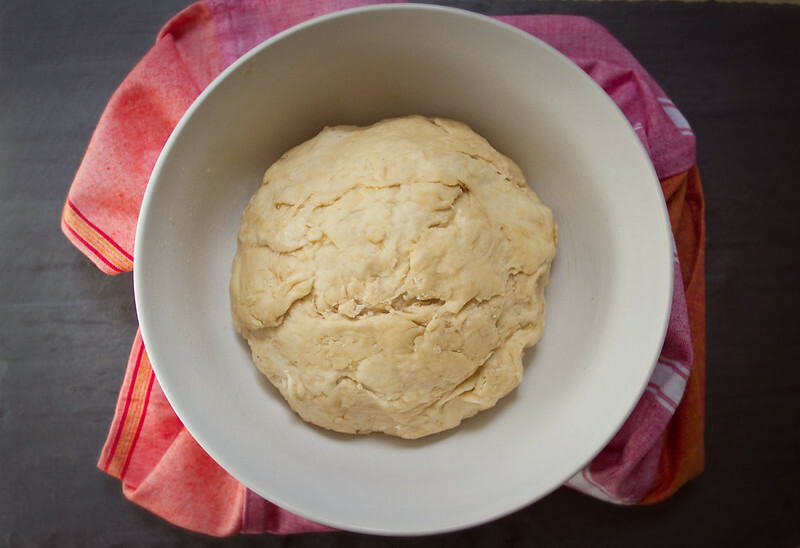 Once dough has risen, combine the remaining 1/2 Cup beer, the 10 Cups water, and the baking soda and bring to a boil. Preheat oven to 450 degrees fahrenheit. Divide dough into 8 individual segments. Take one segment and roll into a long rope on a lightly floured surface. I start with my hands in the middle of an oblong piece and then roll it back and forth to form the rope, while also moving my hands towards the outer ends of the rope, when I get to the edges I pick my hands up, put them in the middle and roll some more. This way you're always pushing from the middle out, constantly lengthening the rope. I roll my pretzels out to be about 18inches long, then form the rope into a U, twist the two ends around each other, and stick the ends to the bottom of the U, forming a pretzel shape. 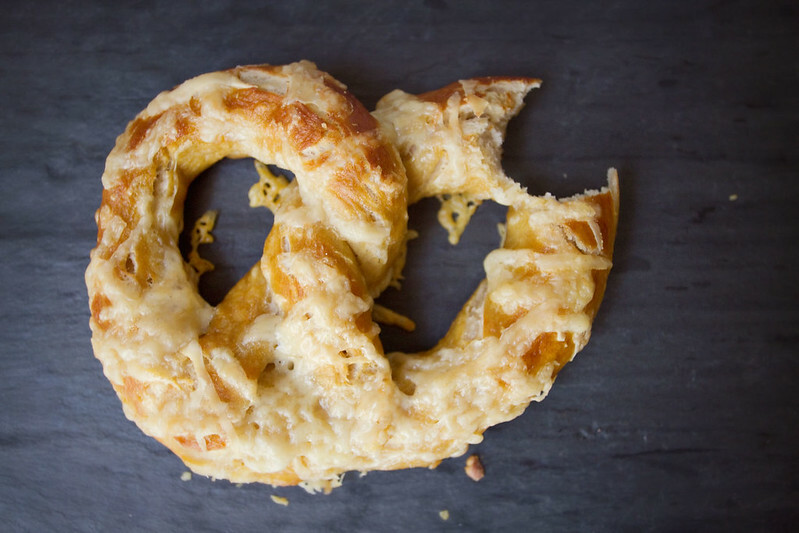 I made a gif part way down the page to illustrate pretzel folding- it's super easy. 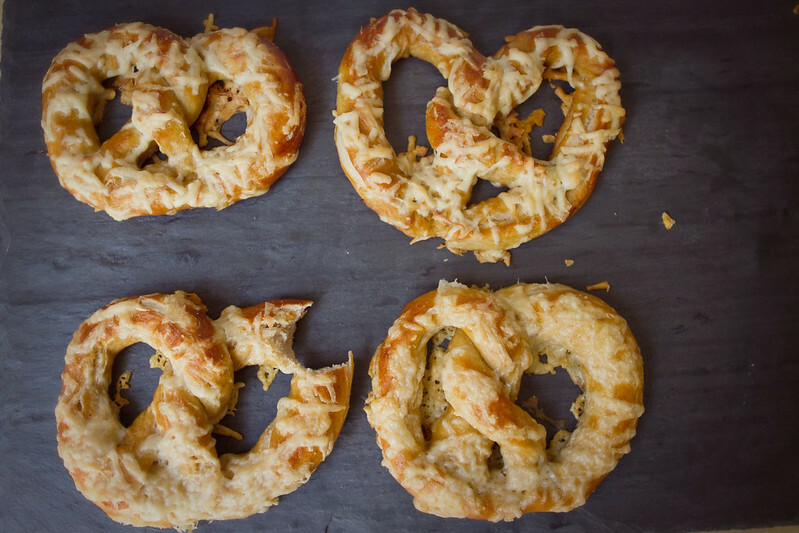 Once your pretzels are shaped, boil them for 30 seconds, 1 at a time in the beer/water/baking soda combo, then remove with a spatula and place on a lightly greased parchment paper on a baking sheet. Brush with the yolk/water mixture and top with grated cheese. Bake for about 12 minutes or until the pretzels are a deep golden brown and the cheese has melted. 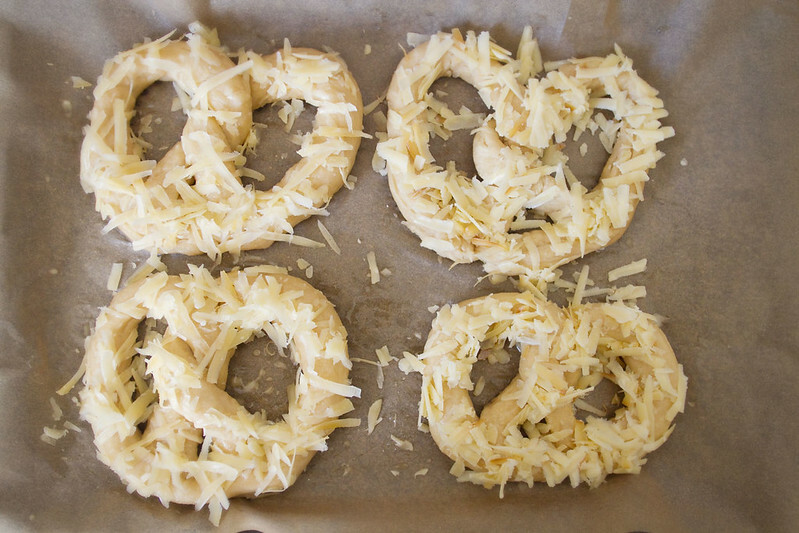 I made a few cheese-less heart shaped pretzels too. To make these roll your dough out to about 15" then roll the ends a bit more until they're narrow and tapered, take the ends and twist them together into a cute twist, then form a heart with the twist as the dip in the middle of the heart, and pinch the dough to make a slightly pointed bottom. When you place this into the boiling water try to retain a heart shape. It's way easier than it looks so give it a shot! 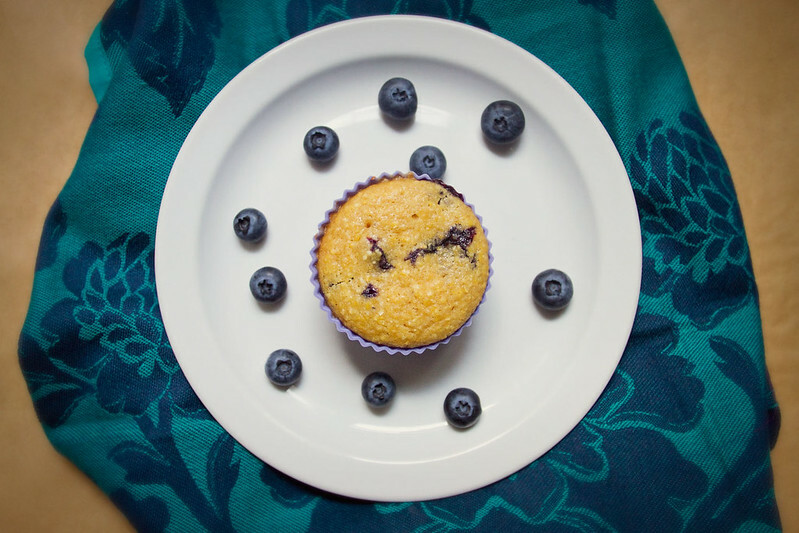 Freshly baked blueberry corn muffins and a tall glass of orange juice was always one of my mothers go-to weekend breakfasts when I was child. 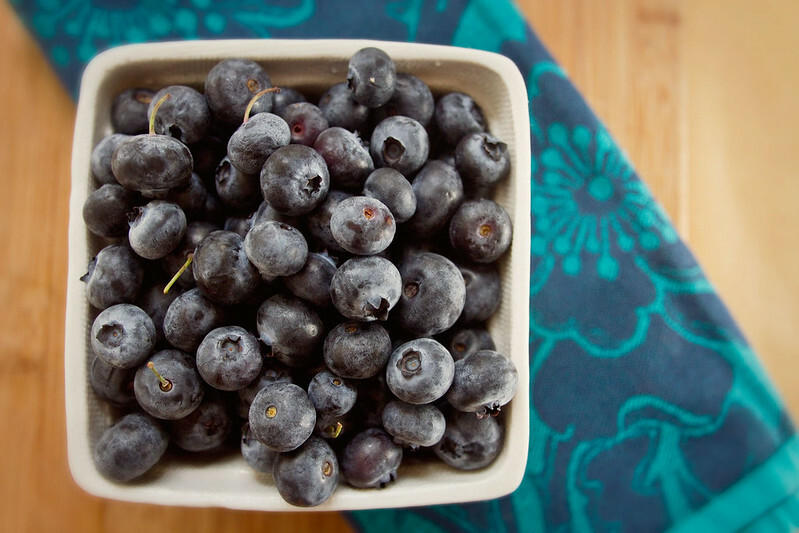 Sometimes we made them together in the mornings, sometimes I sat huddled by the warm heater vent while she made them, and sometimes I woke to the scent of baking blueberries filling the house. They were a great weekend breakfast, quick to make, consumable at the table with some butter or in the car, plain, on our way to some adventure. 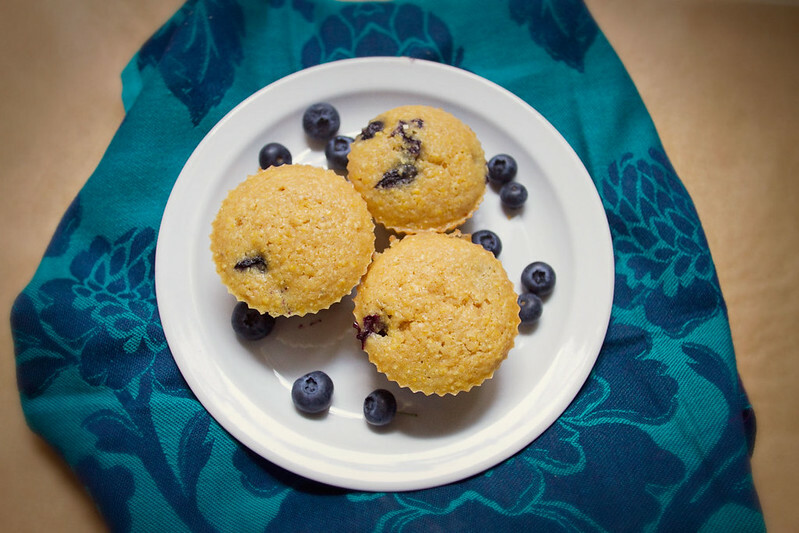 While I was in Ohio last week we made several batches of blueberry corn muffins throughout the trip. 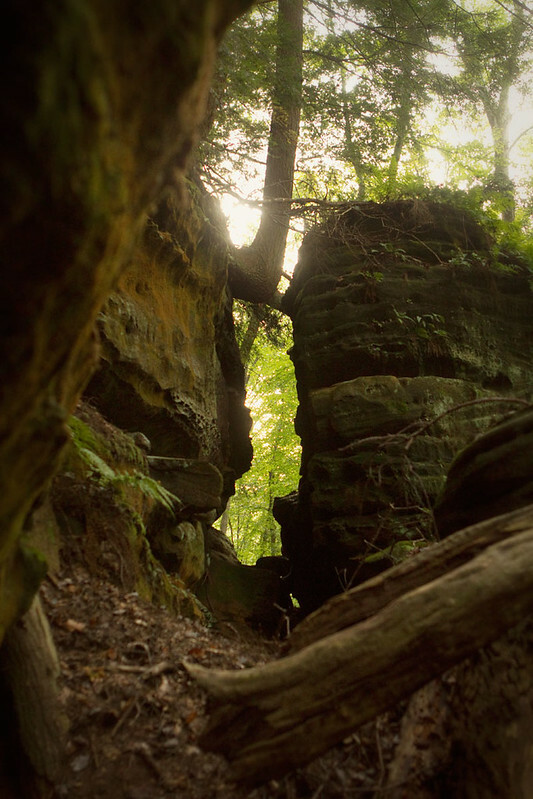 The morning we left Cleveland for Hocking Hills in Southern Ohio, we made a batch to bring along in the car. 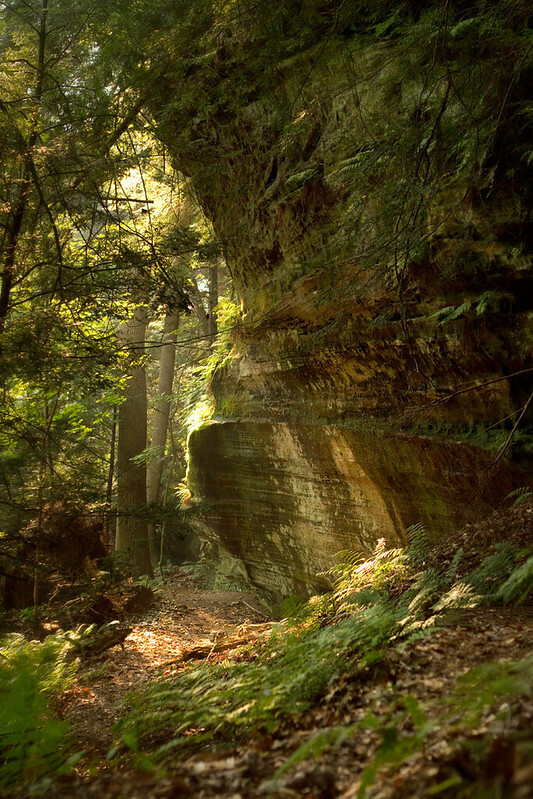 Hocking Hills, now simply called Hocking by most of my mothers family, is a lovely place of cliffs and trees, and another aunt and uncle have a vacation home there, though you're more likely to find them there than their normal home up in Cleveland. 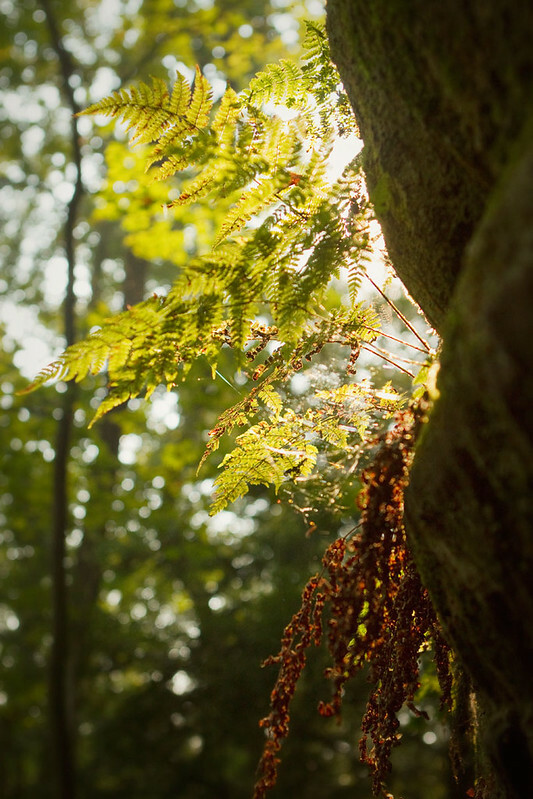 We spent a night there en route to West Virginia, and I climbed trees, hiked along the narrow paths my cousins children of have forged all over the cliffs, and caught up on family gossip. 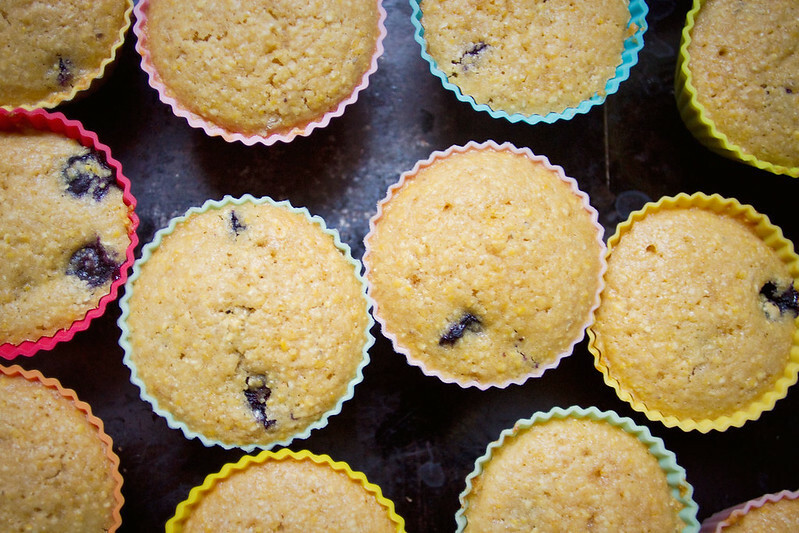 When we returned from roaming through Appalachia we made another batch of blueberry corn muffins, and it was then that I had the idea to make orange juice blueberry corn muffins. 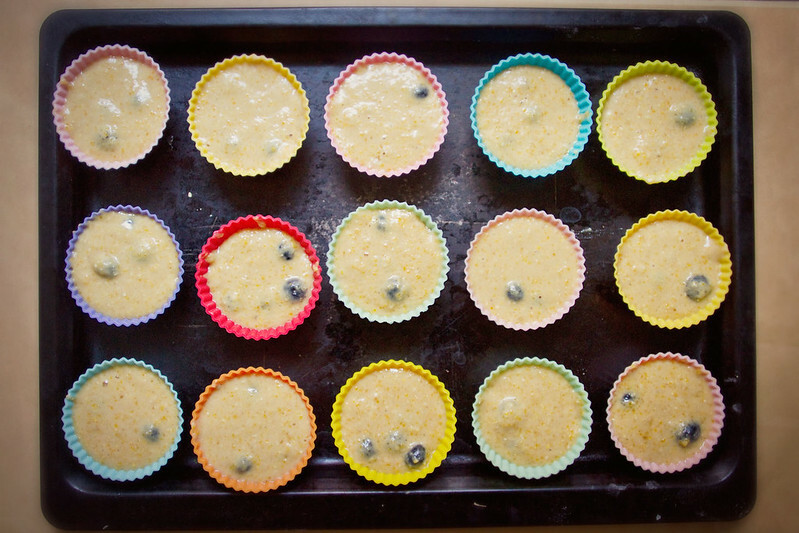 Orange juice blueberry muffins. It was bound to work- I already make orange juice cupcakes (swap the milk in the directions on the yellow cake mix box with orange juice), so I knew Orange Juice worked in baking. I figured why not. I'm lactose intolerant and as a child my mother worried I wouldn't get enough calcium, so when orange juice with added calcium became a thing she bought it as fast as I could drink it. I had a glass of orange juice every morning of my entire k-12 school career, I am pretty sure. Sometimes I drank it sitting by the kitchen heater vent (seriously, I loved that heater vent) on cold winter mornings. The warm air and delicious juice distracting me from the cold march down the street through the Ohio lake effect snow to school. The orange juice in these muffins makes them a little sweet, a touch tangy, and lends an overall fruitiness to the batter. I used orange juice with pulp, so don't worry about needing to get pulp free, there were no little orange bits discernible in my muffins. Just sweet, delicious breakfast-y goodness. These are lovely, they would be the perfect compliment to a brunch or breakfast party, and would also be perfect at a kids birthday party or other afternoon event. Or they're great for breakfast on the weekends, with a tall glass of orange juice (or a cup of coffee), feel free to eat one while huddled in front of a running heater vent, for full effect. Preheat oven to 375 Degrees Fahrenheit, if using a metal muffin tin grease or line with paper muffin liners. 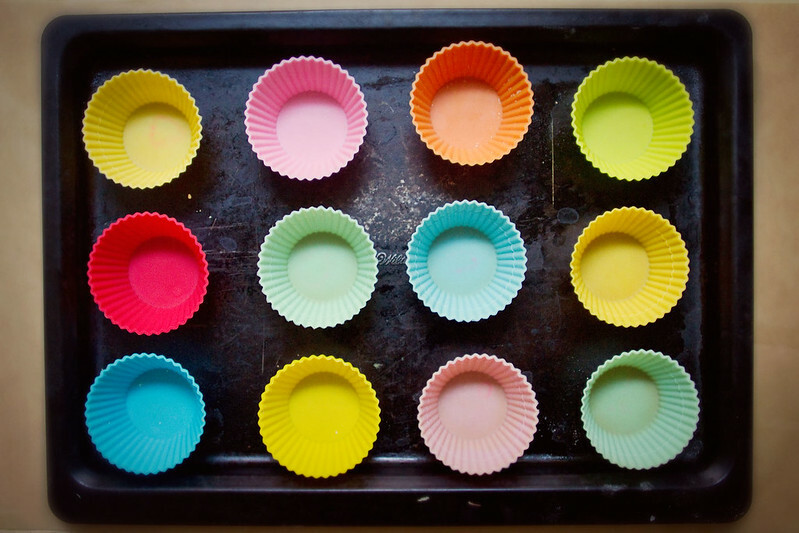 Or use silicone muffin liners like me. Remove orange juice from refrigerator to bring to room temperature. 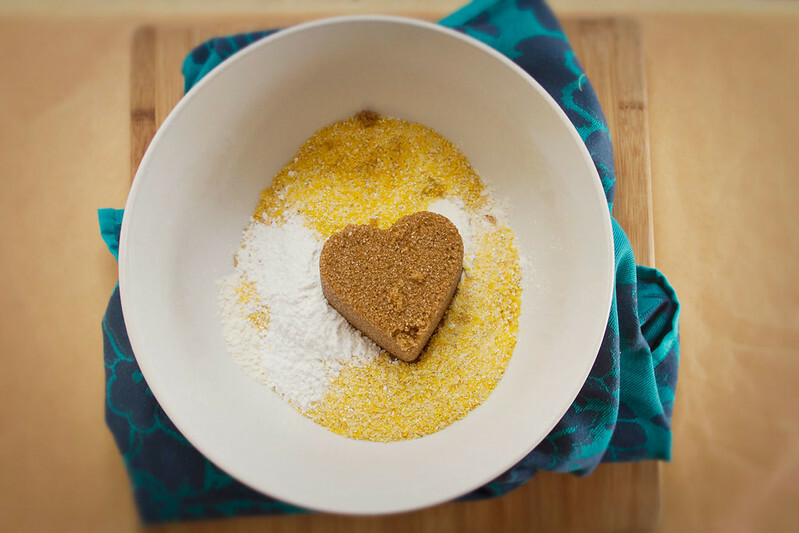 Whisk flour, cornmeal, brown sugar, salt, and baking powder together until well combined in a large bowl. 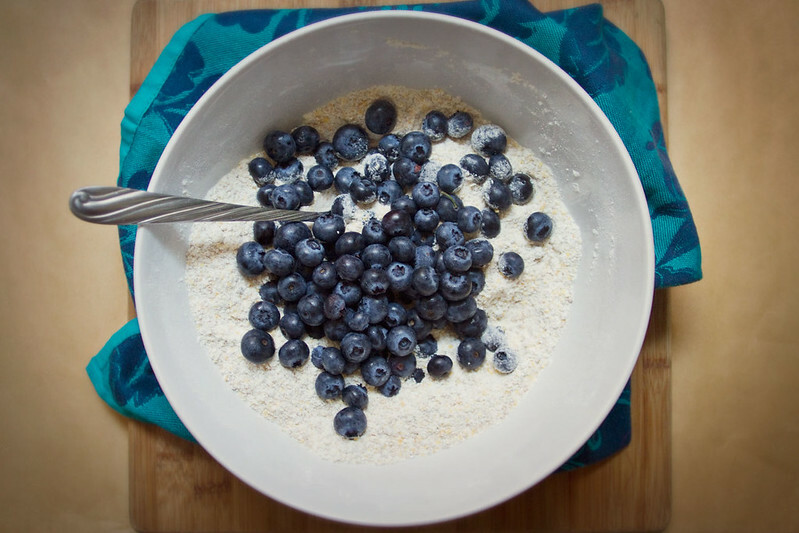 Dredge blueberries in the mixture (add them and mix them around so they're all well covered in flour and spread out). In a smaller bowl, combine melted butter, the egg, and the orange juice. If your orange juice is still cold, microwave it for about 20 seconds or heat it over the stove a moment until it's lukewarm. Cold orange juice can re-solidify the butter. Whisk wet ingredients until well mixed. Slowly pour the wet ingredients into the dry and mix until just combined. Mix until there is no dry mix left, but do not over mix. Spoon into the muffin tins. In my mothers metal tin this made 12 muffins, but my silicone ones must be smaller because it made 15 of those. Bake in preheated oven for 18-20 minutes, until risen and cooked through. 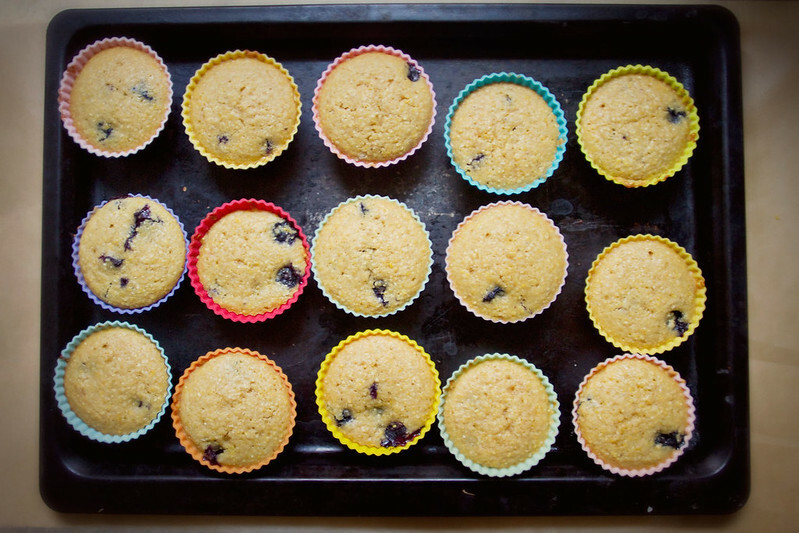 Allow muffins 5-10 minutes to cool before removing from the tin or liners. When I was a child my parents always said West Virginia was "All ridges and hollers," no flat land to be seen anywhere. 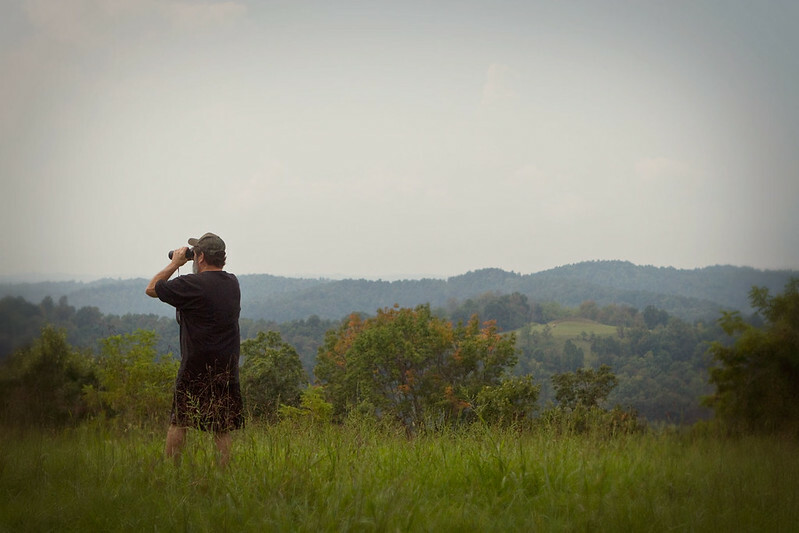 My Aunt and Uncle live at the bottom of one of those hollers, and we always referred to the sprawling, narrow reach of their land as simply "The Holler." As in, "We're heading down to the Holler this weekend to see Patsy and Bob." I thought of this as the name of their land, The Holler. I don't know how old I was when I realized holler meant hollow. Way too old, lets put it that way. They live at the end of road, which turns off of a named road, but doesn't bear any signage or name itself, to my knowledge. It's a dirt road, and it curves down the hollow at a steep angle before ending at the very bottom, where it joins with a creek. 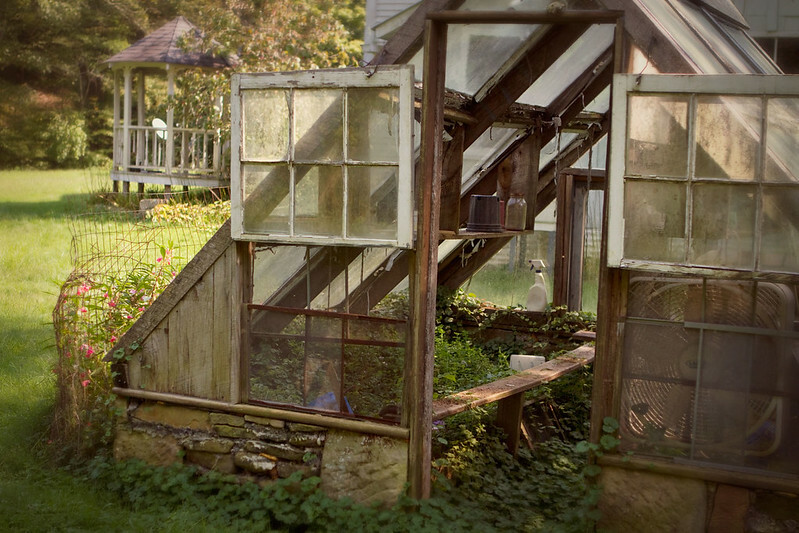 Their home, their land, is the last home at the end of the road where it joins with the creek. This, to me, has always seemed a wonderful place to live. At some point in my teenage years my aunt and uncle decided they would really rather everyone call their land the Homestead, and while it's mostly caught on, I still fondly refer to it as the Holler in my head, for as a child the Holler came to represent everything that was wild and free- I could play barefoot in the creek, explore the abandoned houses and myriad of caves that lined the hollow with my cousins, take a wild ride straight up the side of the "mountain" in my uncles suv, moo at their neighbor's cows, locate and attempt to ride their half wild horse, and even when we went to church on Sunday there were cookies afterwards and a tree in the church yard I liked to climb. 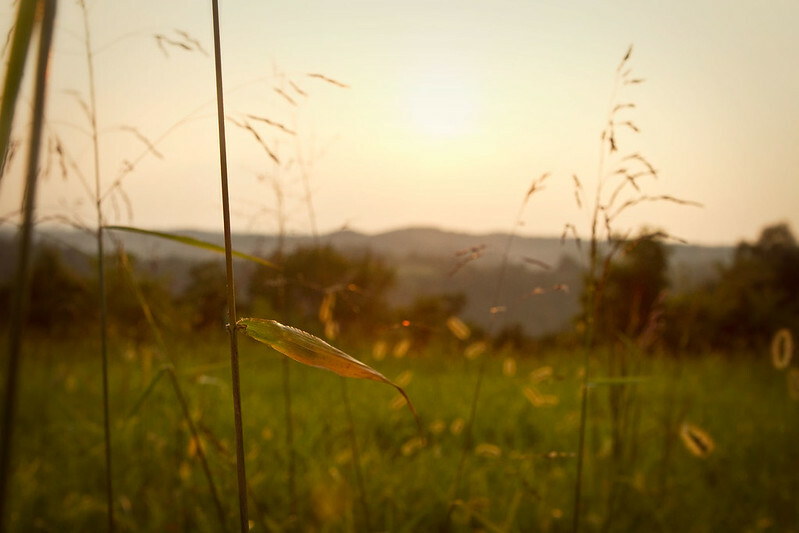 For me holler isn't just a colloquial term for hollow, it's synonymous with the wild, unconstrained joy of a child turned loose in a large field. Last week I spent some time on my aunt and uncles homestead, and largely discovered that not much changes down there, except that the half-wild horse's bones were found a few winters ago, the abandoned houses have further rotted into the ground, and they've replaced the gaggle of dogs they used to keep with two cats who live outside, keep the moles at bay, and tried to eat every food I brought out to photograph. 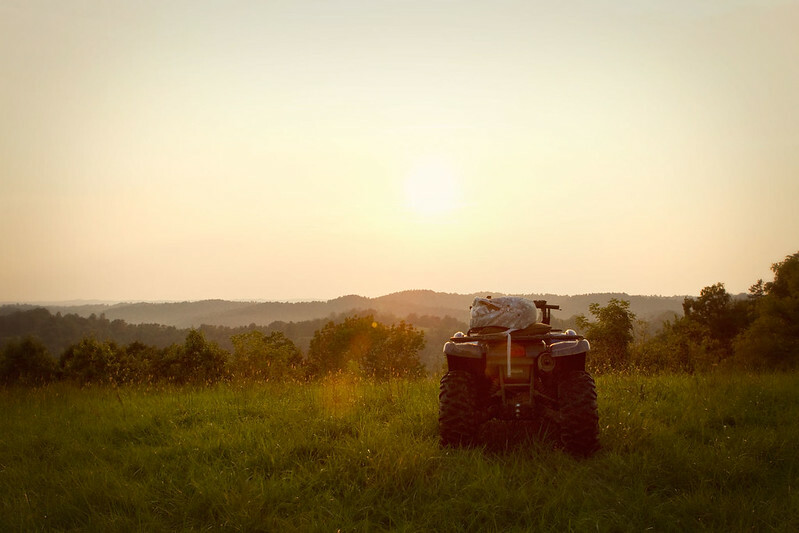 By day my uncle took me up the ridges and down nearly completely vertical drops back into the hollows on the back of his atv whose warning sticker very clearly said not to carry anyone on the back. 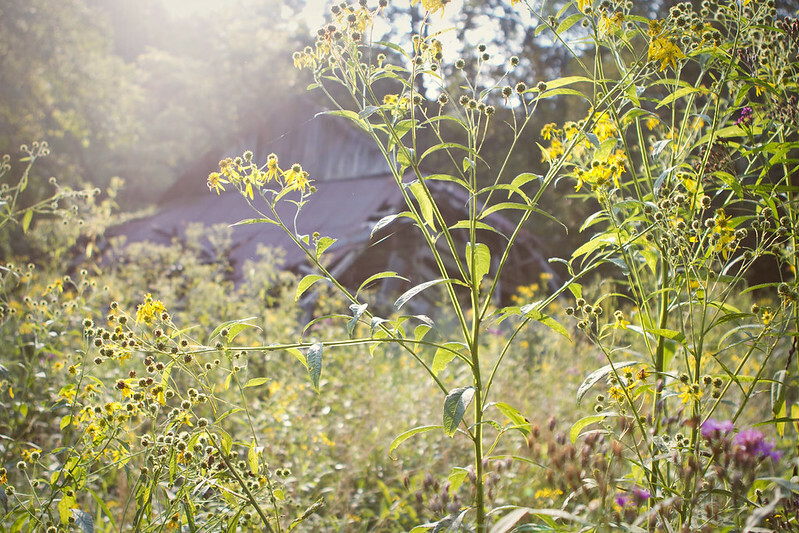 I brought my camera, and we circled wild apple trees looking for ripe ones, scared deer out of the path ahead of us, saw a phantom barn on a hill we couldn't locate, and I photographed every abandoned house and barn we could find. When I was a child, this place was called the Hay House, it was intact enough then to walk in through the front door, and there was newspaper covering the walls of the front room in lieu of wallpaper, if I remember correctly the dates on the newspapers were in the 1920's or teens. I believe it was a house, but it's much smaller than the other Homesteads in the hollows around there, so I'm not certain. 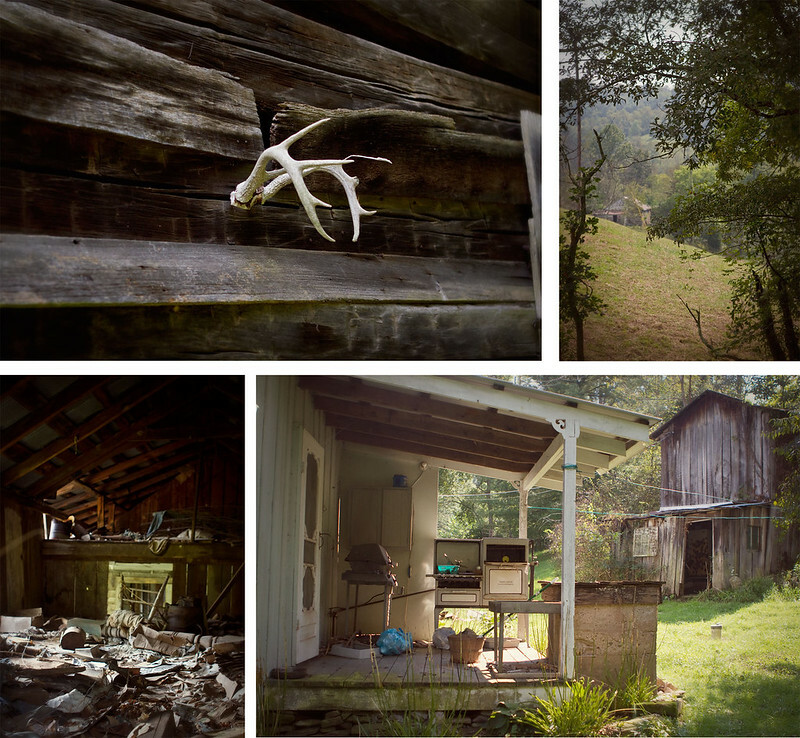 We also came across several abandoned old homesteaders houses, some of which my uncle knew the stories for, but one, the bottom left photo above, he had never even come across before. It was a large house, facing the dirt road we were on when we came upon it, just around the bend from a little house which had belonged to two old bachelor brothers who farmed the land together all their lives. 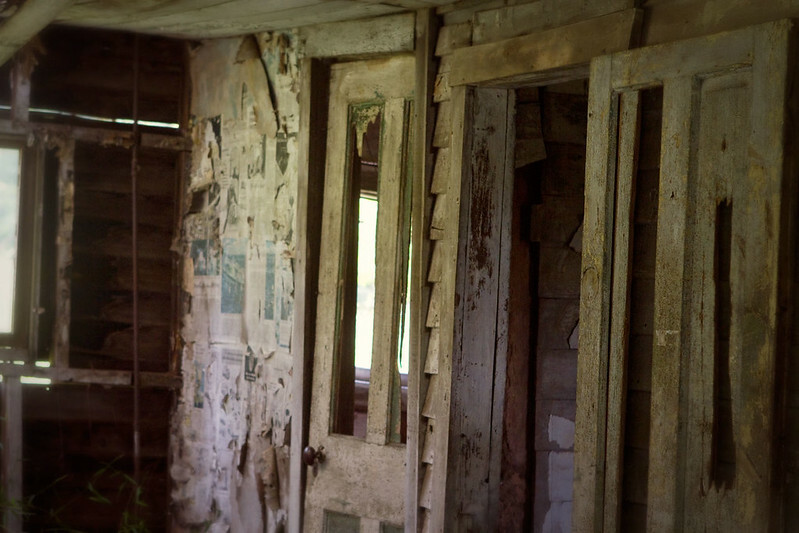 All of the doors were blocked by various fallen bits of the house, but the inside was still pretty intact- here you can see that like the Hay House, the tenants here had wall papered with newspaper, probably for insulation purposes. I couldn't get close enough to read any dates, but the house was nearly identical in style to my aunt and uncles, which dates about 1892. 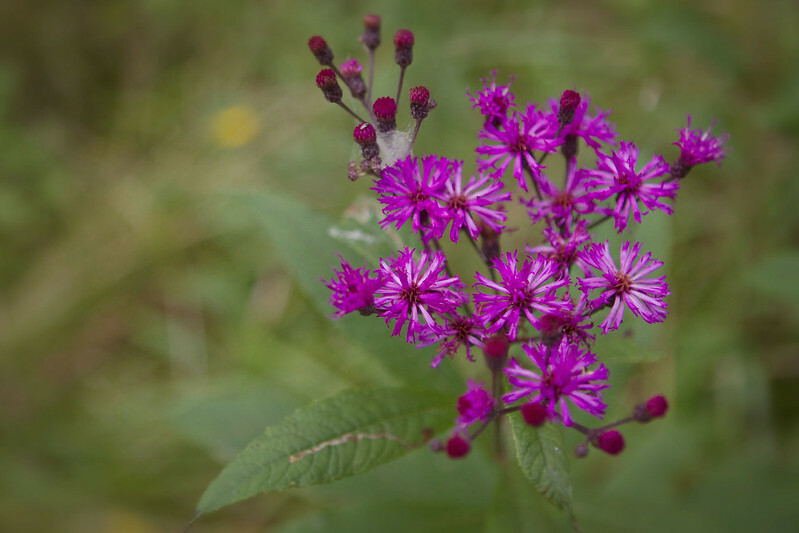 One afternoon I followed the creek a long way, I found an old rusty horseshoe and an arrowhead, scared a deer out of the creek ahead of me, glimpsed a few turkeys, and only had to go in over my knees once. 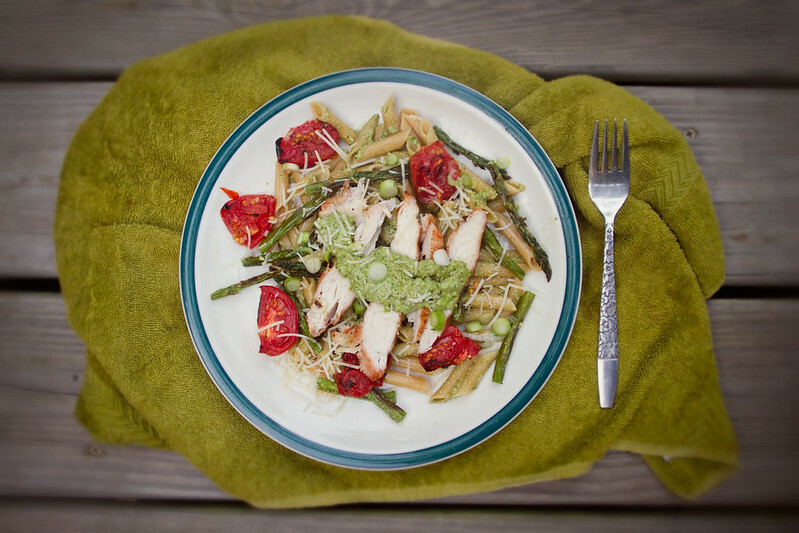 One evening I made this delightful charred vegetable and pesto covered penne, while my mother and aunt cooed at my cousins baby via skype and my uncle grilled the chicken. It turned out lovely, I forgot what a simple luxury having a grill is. Boil penne until al dente. 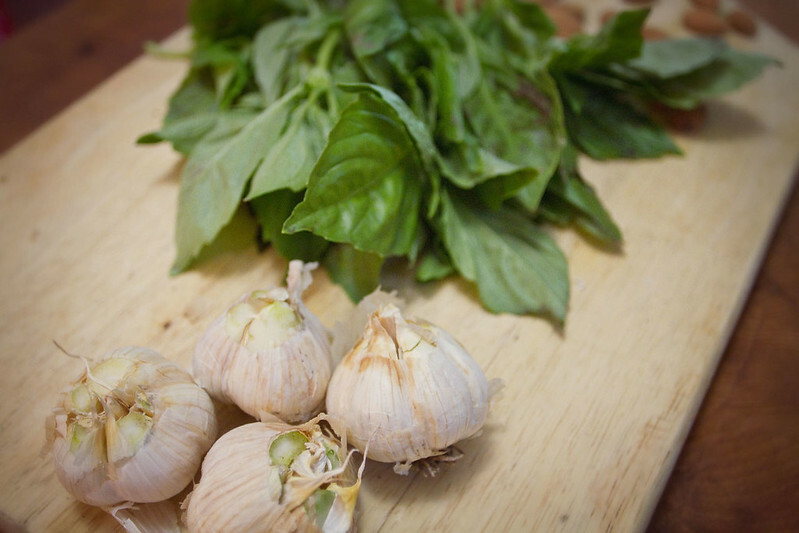 While the water boils, make your pesto. 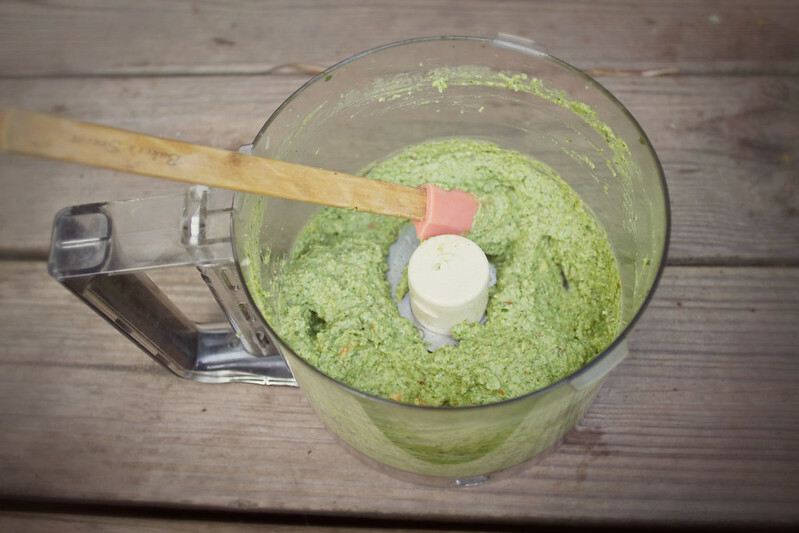 Roughly chop the scallions, then place all pesto ingredients in food processor and blitz until well combined and fairly smooth. The water is optional, and will make a slightly creamier, saucier pesto. Without it the pesto will be thicker and grainier, olive oil amounts also affect this. Personally for this recipe I like a saucier Pesto, and I used a 1/2 C olive oil and a bit of water. If you prefer a chunkier, more rustic pesto, keep an eye on your food processor and stop when there are still some chunks. 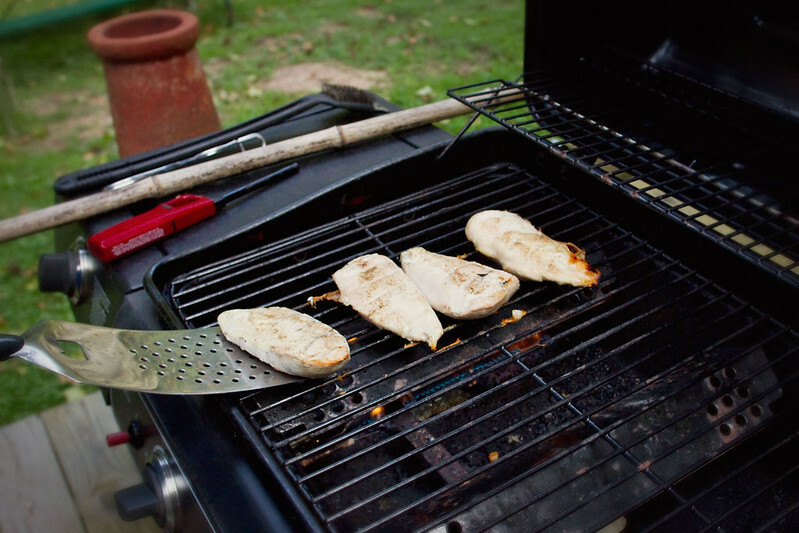 Grill chicken while pasta cooks, either on a grill over medium heat, turning frequently, or in your broiler for about 12-15 Minutes. I simply salted and peppered my chicken, but you could marinade it if you want. However, I find the pesto sauce adds plenty of flavor. Cut Asparagus into 2-3 inch lengths, and place on greased, broiler safe baking sheet and drizzle with olive oil, add a touch of salt and pepper. 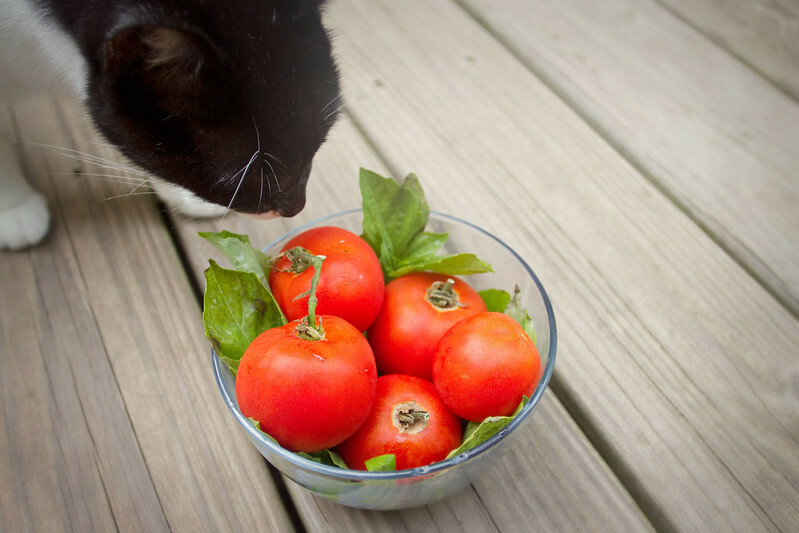 Cut tomatoes into halves or quarters depending on the size of your tomato, you want pieces small enough to pop in your mouth. Place tomatoes on separate greased baking sheet and drizzle with olive oil, salt, and pepper. Turn your broiler on and let it warm up a minute, then add the asparagus. After about 2-3 minutes add the tomatoes. Let cook, checking frequently, until both the tomatoes and asparagus have some blackened bits. I found this took the asparagus about 7 minutes and the tomatoes about 5 minutes. Add about 1/2 your pesto to the pasta and toss to combine. 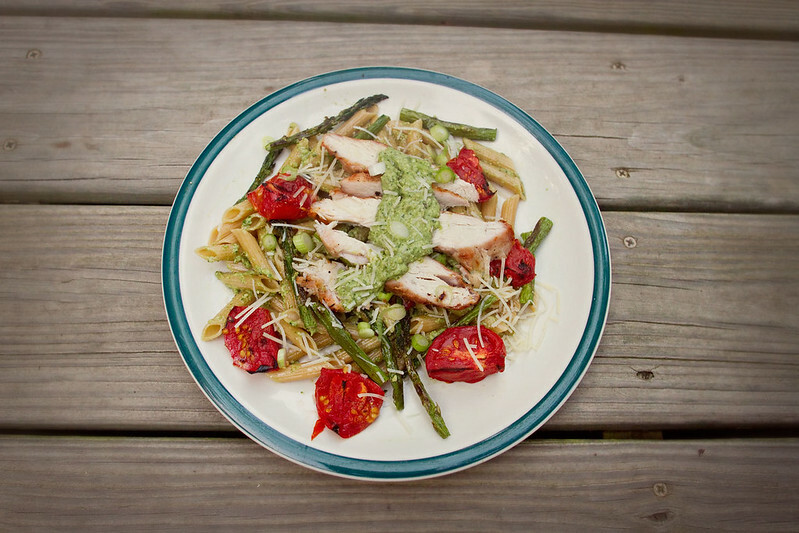 Add some pesto pasta to your plate, top with chicken and charred vegetables, and a hearty dollop of more pesto. If you saved some scallions chop them up thin and sprinkle over top for an extra pop of flavor. Serve immediately and enjoy thoroughly. 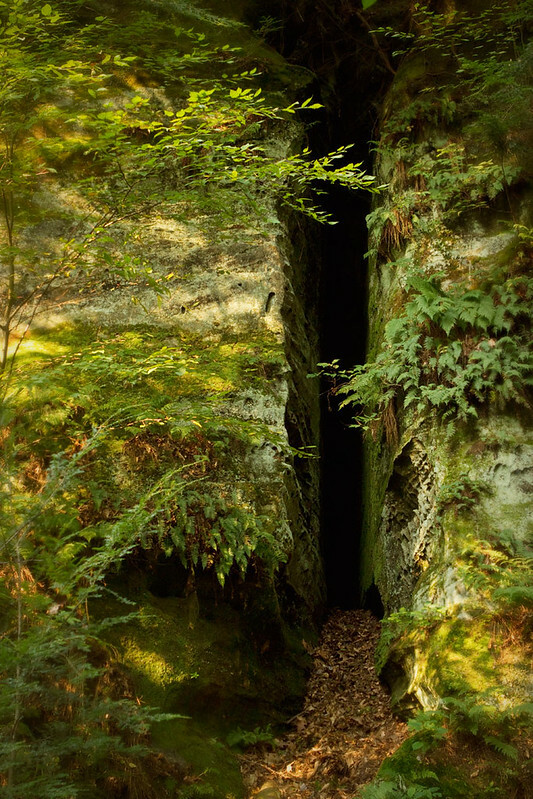 I decided to escape the city for week, so I headed to Cleveland and met up with my mother, and together we headed down to Hocking Hills, where my aunt and uncle live, and there I hiked, and explored caves, and admired my uncle's handmade wooden bowls, and ate their superb cooking. Then we got back in the car and continued south to Spencer, West Virginia, and my other aunt and uncle's homestead at the bottom of a hollow, where I road atvs to abandoned barns, and cooked, and found a old rusty horseshoe, and basically it was great, and there shall be posts about the foods soon. However, I shot this post before I left for the midwest, and and so I present it to you today, midway through my trip. I really love ice cream floats, despite being lactose intolerant, so I set out to make a vegan float, using my favorite sorbet, Blue Moon. 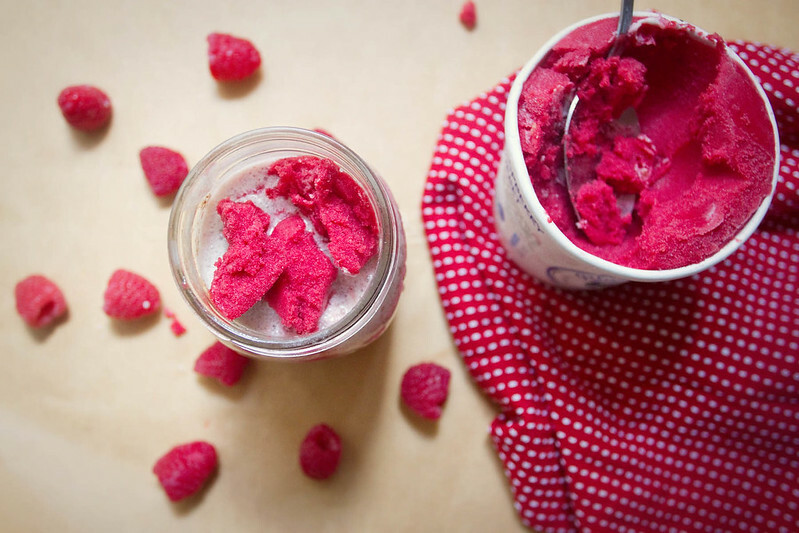 To create the creaminess of melting ice cream, I added a bit of coconut milk to the raspberry soda, and aside from cream it adds a lovely nuttiness, but you could definitely try out soymilk if you don't like coconut milk. The liquid elements are reminiscent of what was always called a French Soda at the coffee shops in Cleveland when I was growing up, fruit syrup added to seltzer to make a fruit soda, then a splash of heavy cream or half'n'half on top. 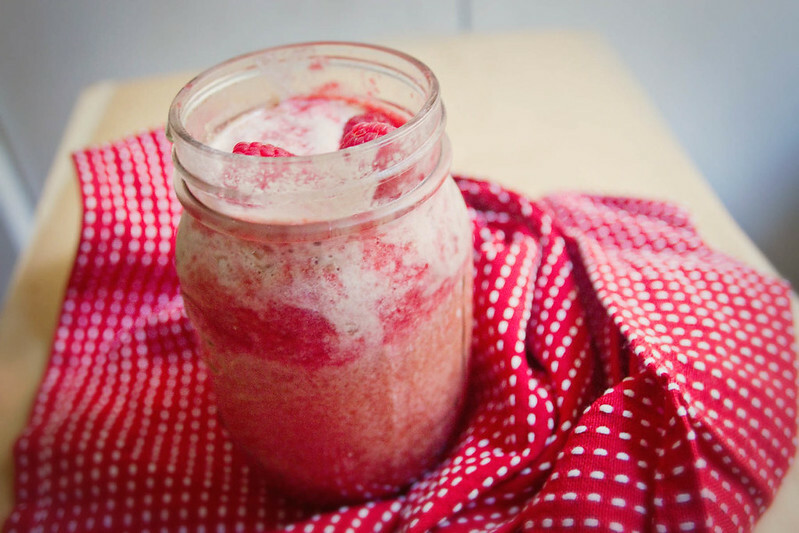 The addition of the ice cream takes this drink from a delightful creamy soda to decadent, delicious dessert. The coconut milk froths up in a lovely fashion reminiscent of the stiff foam on top of root beer floats, and the bright pink sorbet makes a lovely contrast against the white. I devoured the float you see in these photos, essentially in place of lunch, as I often do with the foods I make for this blog, and then I made it again for S and myself after dinner, and then the next morning I made a nonvegan version, which I then ate for breakfast. Basically, I loved this and just kept making and eating them until I ran out of supplies. Hope you enjoy it as much as I did! 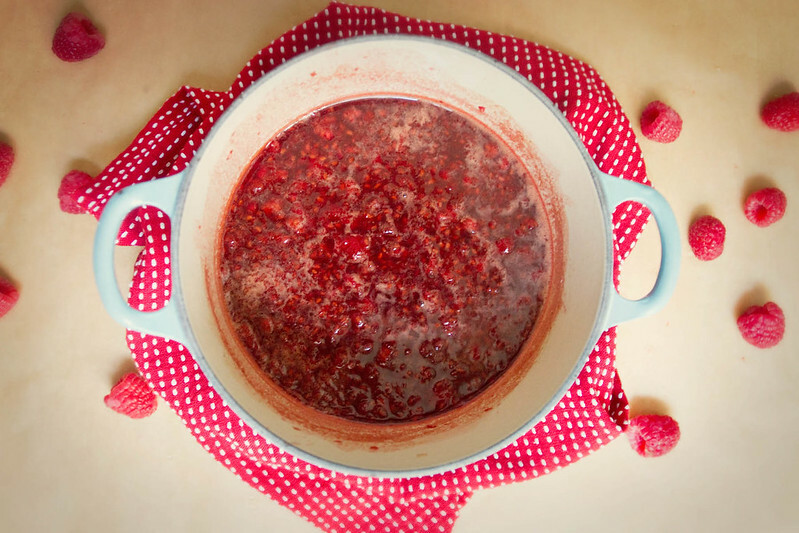 Combine all ingredients in a small saucepan and bring to a boil over medium heat, reduce to a simmer, and cooking, stirring often, until all the raspberries are broken up and the syrup has cooked down a bit, about 7 minutes. 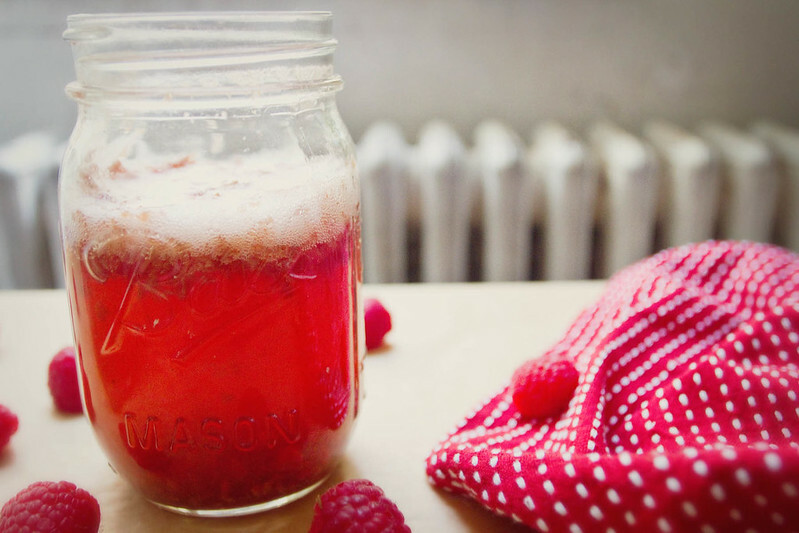 If you don't like raspberry pulp and seeds in your float, then pour the syrup through a fine mesh strainer into a measuring cup before using, and discard pulp. Chill syrup in the fridge, until cool, about 30 minutes. 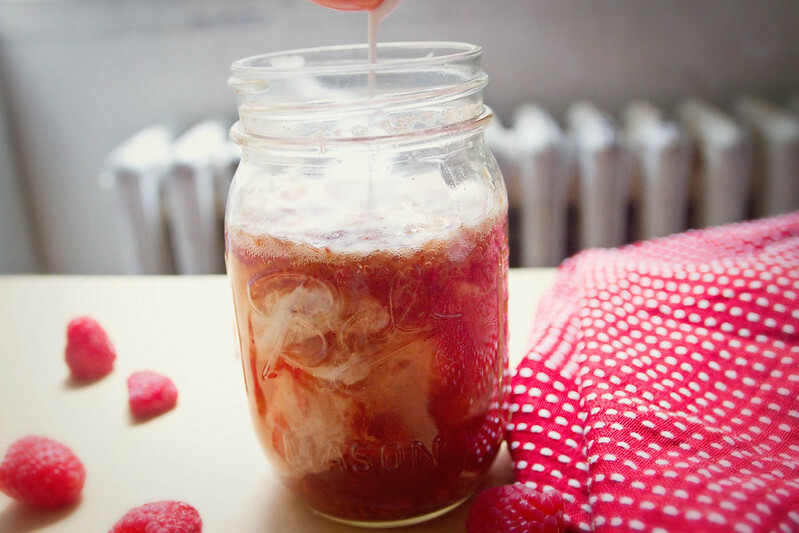 In a pint glass or jar, add 3 tbsp raspberry syrup. Slowly add the seltzer (tilt the glass to avoid too much fizzing), followed by the 2 tbsp coconut milk (or desired amount). 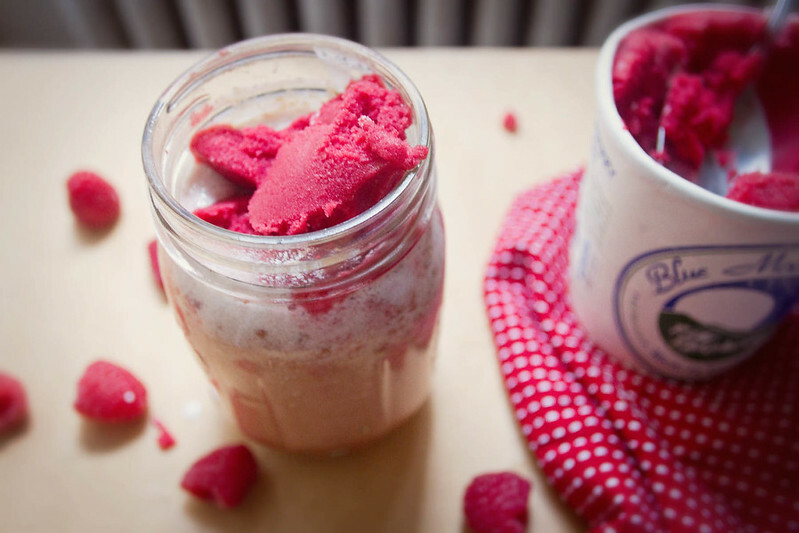 Add two large scoops of sorbet on top of the coconut milk, give it all a little swirl to help the flavors disperse, toss a few raspberries on top of that lovely white frozen foam on top, and serve immediately, as the sorbet will melt a touch faster than ice cream in a traditional float. 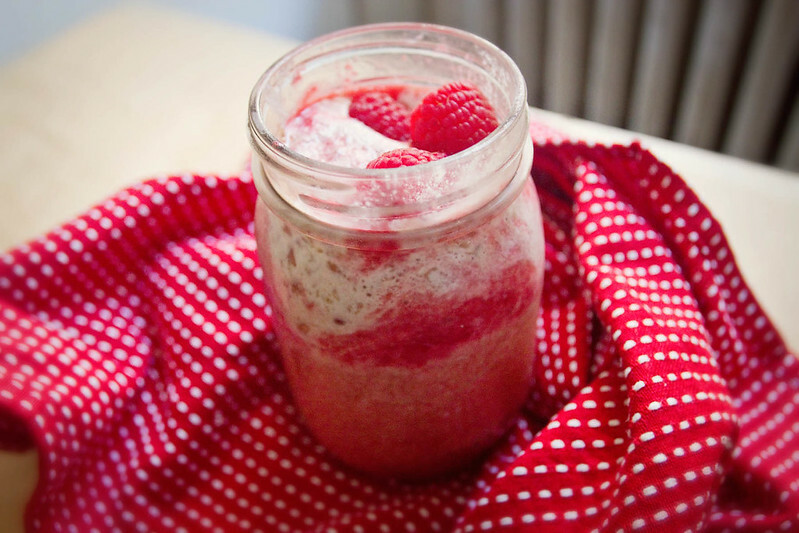 Notes: This morning I made this float again, for breakfast (don't judge me), but instead of coconut milk I used half'n'half, and it was good, the lack of coconut made the flavor a touch less complex, but the dairy from the half'n'half was of course a bit creamier. It was a good, nonvegan alternative. 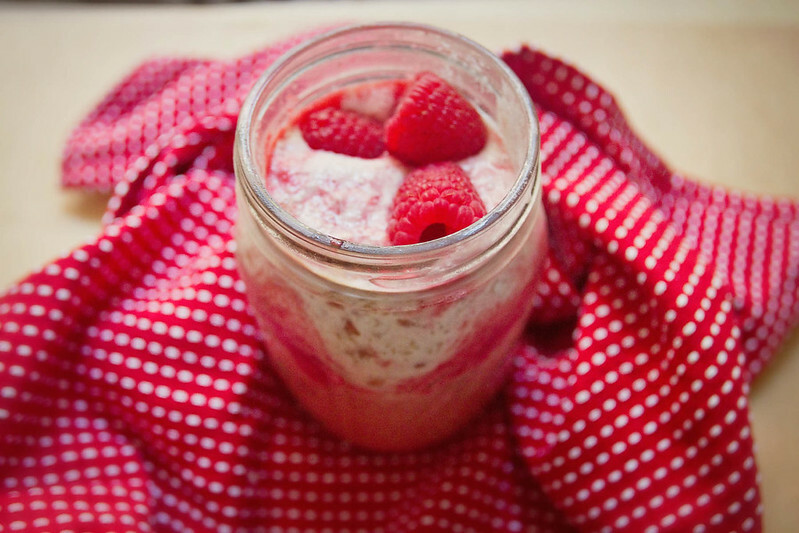 Also, I am sure this would be good with strawberries instead of raspberries. 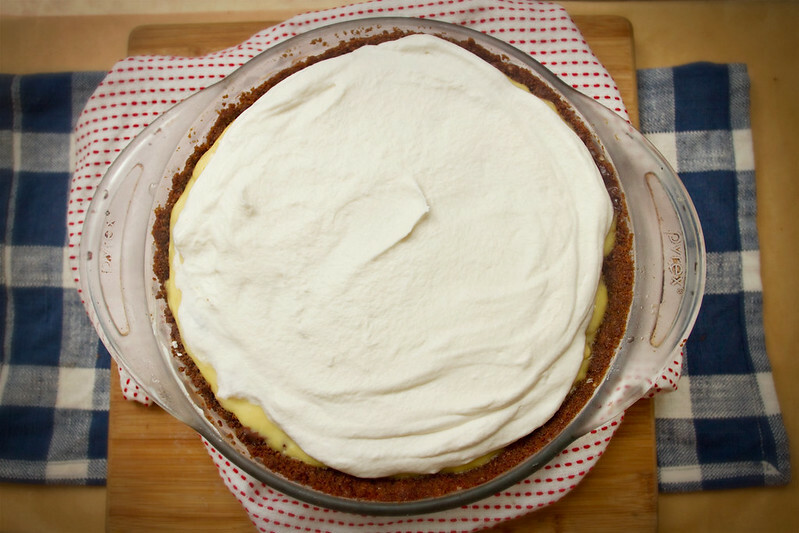 That unassuming, delicious looking banana cream pie has a surprise for you. A dark, sweet, chocolatey layer of ganache is hiding, nestled between the custard and the crust, just waiting to be bitten into and enjoyed. Last monday was S's 25th birthday, and we went camping in the New Jersey Pine Barrens to celebrate, which is pretty much our favorite summer camping destination. There's a great little river and we hike out along some sand roads with big inner tubes, then hop in the river and float back to our campground all afternoon drinking hard cider. 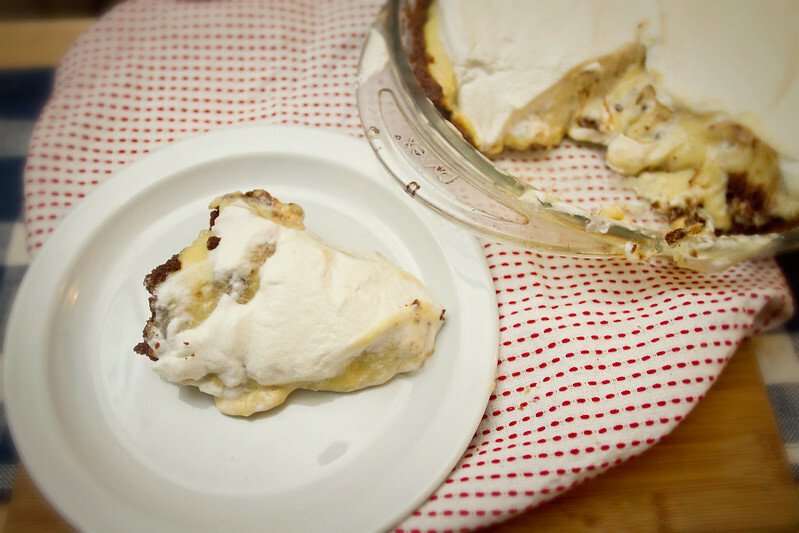 In the evenings we made swiss and pastrami camper pies, and vegetarian frito chili pies and apple-pie-on-a-stick, and basically we just ate pies. It's heaven. 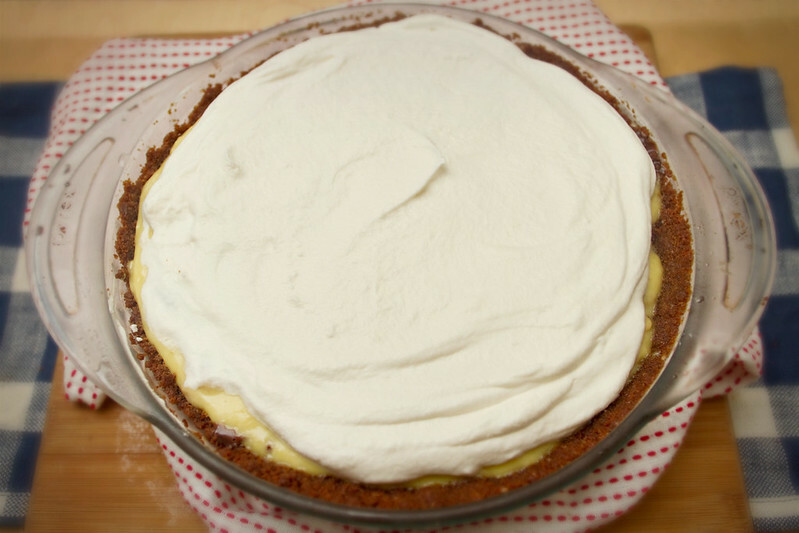 But when we came home, I asked S what type of birthday pie or cake he would like, and he said Banana Cream Pie. With Chocolate. So the pies continued. "Do you want chocolate in the banana filling?" I asked, confused by his request. "So like a drizzle of homemade magic shell on top?" I asked, knowing his love for my homemade magic shell. "Yeah, something like that" He said. I pondered this. 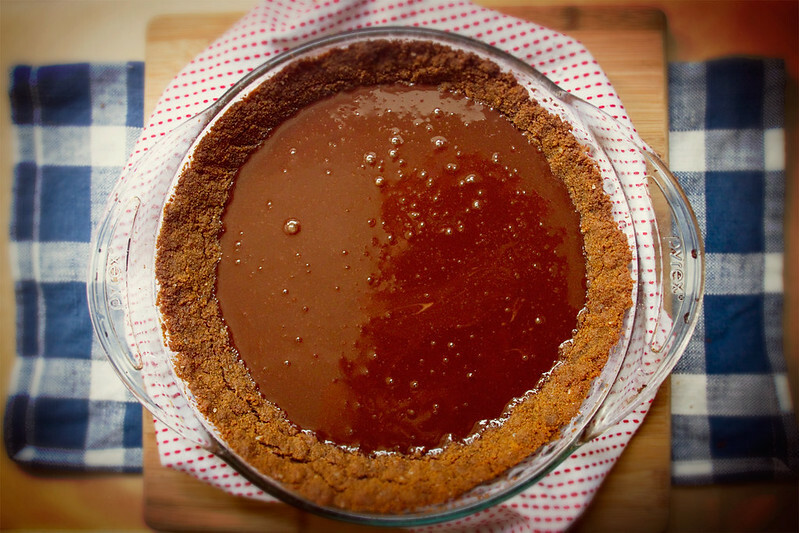 Would the pie be cold enough to solidify the coconut oils and dark chocolate (the only two ingredients in my magic shell recipe)? "What about a ganache layer?" I asked. "No- well, yes, but not too sweet." S stipulated. And so this pie was born. 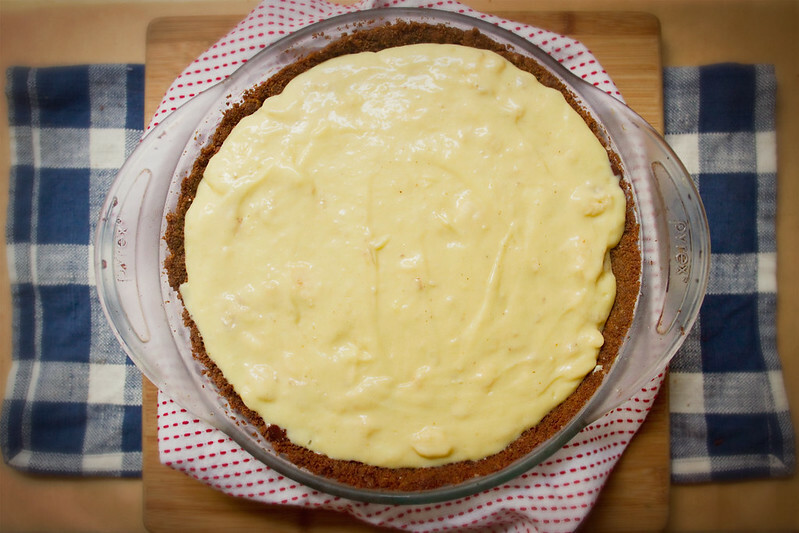 The banana custard filling is borrowed from Bon Appetit, though I added an extra banana, and the crust is a lightly adapted take on Martha Stewart's Gingersnap Crust, though I will admit I used Whole Foods store brand gingersnaps in lieu of making Martha's recipe just to crush them into crust. The store bought snaps worked great, the crust was essentially one giant cookie and everyone loved it. if it holds shape it's ready, if not, add a tiny bit of water. 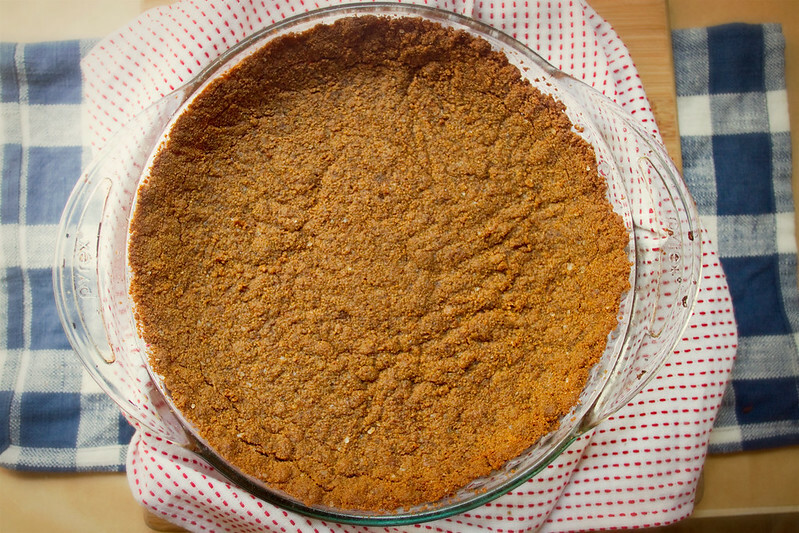 Press crumb mixture into a lightly buttered 9-inch pie plate, evenly covering the bottom and sides. Heat cream and butter in saucepan over medium heat until mixture is hot (do not boil). Remove from heat. Add chocolate and vanilla. Whisk until smooth. Pour into cooled pie crust. Chill crust until chocolate ganache is thick and semi-firm, about 30 minutes. 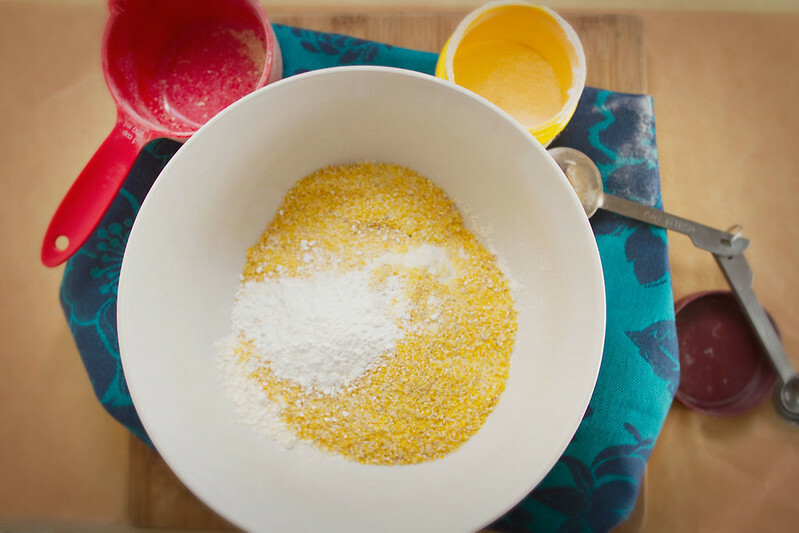 While crust cools, whisk egg yolks, sugar, cornstarch, and a pinch of salt in a medium saucepan, off heat, until smooth. Slowly whisk in the milk. Whisking constantly, bring to a full boil over medium heat and boil until the custard thickens, pulls away from the walls, and is just a bit thinner than pudding, about 3-4 minutes. Remove from heat and whisk in the butter and vanilla extract. Fold in the sliced bananas and let cool about 15 minutes. When pudding has cooled some, pour over the crust and ganache, spread out, and let chill in fridge 3 hours minimum. 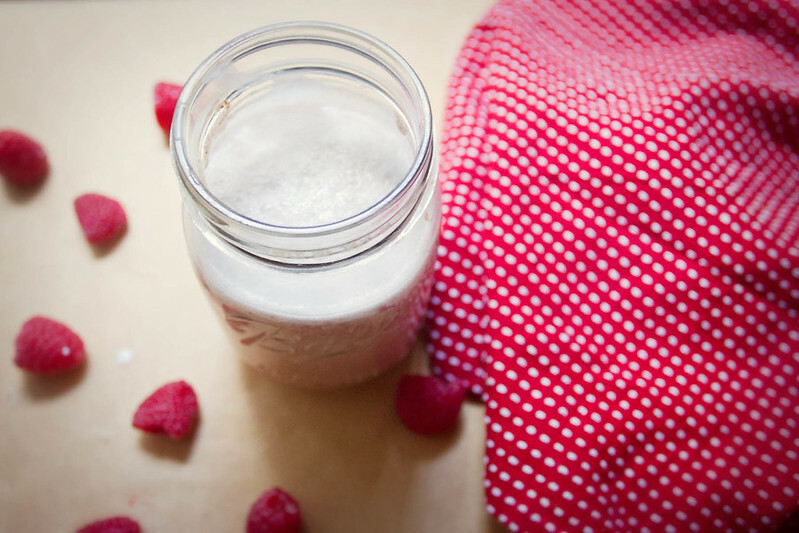 Beat cream, sugar, and vanilla together until firm peaks form. Spread over cooled pie.